In collaboration with KHS, YouTube and pop sensation Lindsey Stirling released a cover of Kygo and Selena Gomez’s summer hit, “It Ain’t Me” on July 17, 2017. “It Ain’t Me” has been playing consistently on radio stations around the country since its release. 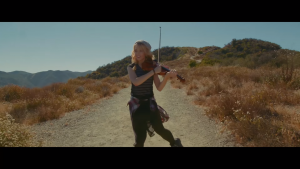 Stirling’s cover of the song brings her signature violin spin and quirky dance moves to the song. Combined with the musical talents of the group KHS, the song is a fresh new take on a song that may have grown stale and overplayed to some listeners. Stirling is known for her fun videos and ability to make instrumental music fun with the use of electronic sounds and her violin. The original version of “It Ain’t Me” is already heavily electronic, and Stirling’s version takes a slightly more raw and folksy spin on the song, while still able to keep it sounding fresh and different enough from what everyone is used to. Covers of songs and fun backdrops and choreography have made Stirling an international star. She was the subject of the recently released YouTube Red documentary “Brave Enough”. She has appeared on numerous talk shows and performed on stages around the world. Stirling keeps her fans entertained by pushing her creativity and trying out new things instead of just sticking to a formula. “It Ain’t Me” combines the elements that her fans love with the fun aspect of some new instruments and a slightly more acoustic version of a song that is already heavily electronic. The video is simple and doesn’t feature too many special effect. In this case, the focus is clearly on the music and talents of everyone performing instead of trying to make it as showy and flashy as some of Stirling’s other impressive work.